From the tip-top of its super teased coif, to the bottom of its dynamic dancing toes, �You Can�t Stop the Beat� of this Broadway musical comedy phenomenon that inspired a major motion picture and won eight Tony awards, including Best Musical. Set in Baltimore in 1962, Hairspray is the story of the pleasantly plump teen, Tracy Turnblad, who will do whatever it takes to appear on the popular Corny Collins show and win the heart of Link Larkin, all without denting her �do. Direct from Broadway where it�s played for over 2,300 performances, Hairspray brings its hipness and hilarity to the Marriott stage. "...It�s tough to spritz fresh ideas on a show like �Hairspray� which spawned 2,500 Broadway performances, Harvey Fierstein in a dress, several well-coiffed tours and even a 2007 movie starring John Travolta, Queen Latifah and Zac Efron. But the Marriott Theatre in Lincolnshire has that master stylist Marc Robin running its rotund salon. And his choreographic efforts here are positively Olympian (small comfort, I know)." "...Too bad Lincolnshire's Marriott Theatre operates on a tight subscription calendar, because were it not tied to a slate of continually changing shows, Marc Robin's altogether phenomenal, boldly sung, zestily comic, dance-till-you-drop production of "Hairspray" could probably run on its in-the-round stage for a couple of years. As it is, this fabulously energetic and inventive take on the Tony Award-winning hit musical inspired by John Waters' playfully subversive film should become a gargantuan box office success, with the only concern being whether the stellar cast can sustain the sheer aerobic momentum needed to perform it eight times a week." "...Director/choreographer Robin deserves kudos for keeping the stage abuzz in a constant swirl of 1960s dances and movement. Even if some of the focus gets lost thanks to necessities of the theater-in-the-round surroundings, Robin's overall work is stellar." "...This Tony-winning musical is even larger than larger-than-life in Marc Robin's in-the-round staging. Based on the John Waters film set in 1962 Baltimore, Hairspray tells the story of Tracy Turnblad, a zaftig teen who loves to dance and tease her hair to dizzying heights." "...In-the-round staging inevitably makes for unequal sightlines ( the northeast corner gets the best view this time ) , but under Marc Robin's direction and choreography, the mostly ensemble hoofing revels in the kinetic ebullience characteristic of his period's increasingly youth-oriented vox pop ( while still contriving to work in a tap number ) . Marissa Perry's Tracy leads her high-school crusaders with the stamina of a percheron and the voice of a Belting Betty Boop, flanked by Heidi Kettenring and Billy Harrigan Tighe as sidekicks respectively mousy and hunky." "...Marc Robin�s platinum touch reliable wonders because the best actors want to work�and play--with him: He brings out their best in them. The dances are both period-perfect and fresh to go. Every stereotype here reinvents its real-life origins, starting with Marissa Perry�s indomitable dreamer Tracy, a life force who changes everyone she meets. These include her self-denigrating mother (Ross Lehman, owning Edna corset and all); her addlepated dad (genial Gene Weygandt), her late-blooming best friend (Catherine Lord, on top of every growth spurt), her moves mentor Seaweed (Josh Breckinridge), her dream date come true (Billy Harrigan Tighe), even her bratty nemesis (Johanna McKenzie Miller, loving our hate). Theatrical treasure troves, otherwise known as Hollis Resnik, E. Faye Butler and Bernie Yvon, do no wrong as, respectively, the reflexively racist but still redeemable producer, earth-mother Motormouth Maybelle and far-seeing Corny Collins. They give so much joy someone will try to tax it." "...The music under the direction of Ryan T. Nelson fills the theater perfectly.If you have never seen the play before this is a production that will leave you with a lasting memory, a theatrical experience to remember. If you have seen it before, see it again- this one will knock your sox off and while the Travolta movie version was fun, this entire production is a much better experience as it is "live" with great energy and allows you to use your own imagination and feelings- do not miss this opportunity- you only have until December 6th to get out to the marriott Theatre in Lincolnshire." "...What�s the formula for staging an exhilarating production of �Hairspray?� Hire 29 high-energy performers, including about 10 of the best musical comedy stars in Chicagoland. Then put them in the service of director-choreographer Marc Robin. The result: the best singing and dancing show we�ve seen in this area in a long time." "...This polished production, full of catchy songs, exciting dances and memorable characters, will no doubt be remembered as one of the best Marriott shows in years." "...The moment Tracy Turnblad (played by the radiant Marissa Perry) opens her eyes, jumps out of bed, and starts singing the virtues of another Baltimore morning, you�re hooked. Perry, along with the company of Marriott Theatre�s sparkling new production of Hairspray, kicks off one of the most entertaining evenings you�re likely to encounter this theatrical season or next. Quite simply: Marriott has a hit on their hands." "...Robin knows his directorial way around Marriott�s in-the-round issues, and a terrific ensemble well executes his bopping choreography. The weak spot is Ross Lehman, in fat-suited drag as mom Edna, a role originated by Divine on film and Harvey Fierstein on stage. Lehman�s take is too naturalistic and far too small for a part that�s meant to be literally larger than life." "...Hairspray is a plus size beehive of entertainment with a warm message, an innocent heart that never tries to be anything but a cheerful cartoon fable. Full of funny lines, self-help messages and warm characters, Hairspray is a universal show that leaves you with a smile on your face as you dance down the aisle." "...Take one of the happiest feel-good musicals of all time, assemble an all-star Chicago cast under the directorial genius of Marc Robin, sprinkle in a couple of talented New Yorkers and call it "Hairspray," the most consistently rousing hit of this year's Marriott Theatre season. This is exactly the kind of splashy song and dance spectacular the Marriott does so well, and judging from the feedback of the subscribers in the audience surrounding me, it was sorely needed. You'll be hard pressed to find a peppier production or a more likable cast." 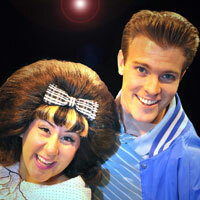 "...The genius of Hairspray is its pulse; when the show starts moving it never slows down, a feat accomplished by the retro rock n� roll stylings of Marc Shaiman�s music and a hilarious but socially conscious book by Mark O�Donnell and Thomas Meehan. Exquisitely directed and choreographed by Marc Robin, Marriott Lincolnshire�s Hairspray captures the limitless energy of the early 60�s with the kind of finesse that makes it all look so easy."